You are here: Home / Proposal Writing / Blah! Blah! Blah! Is that how your Business Proposal really starts? I evaluate Business Proposals. I do this every week. In the last fifteen years, I’ve seen hundreds of business proposals ranging from the large Consultancies to one-man/women businesses. Part of evaluating a proposal is checking that the numbers add up but also to see if the project in question is worth investing in. How do we know that from a fifty page document? We don’t always know, of course. But, we can make certain deductions just by looking at the first ten pages. Or even the first five. To be honest, the Executive Summary is the first hurdle you need to master if you want to get investment. Let’s look at how to do it right. Like we said above, first impressions count. For this reason, you need to pay special attention to the Executive Summary. If your clients or investors don’t get past the Executive Summary, then the rest of your document will go unread. This also raises the question: Should you write your Executive Summary before or after you’ve written your Business Proposal? Some business writers prefer to do it first, others write it after the entire document is completed. I write it at the end as I want the complete text before me. That way, I can digest the document and write the Executive Summary based on what I’ve read. How important is it to users over the next [x] years? What is the business and/or technical road map? Who are the customers and their needs? What is the timing of market development? What are the inter-dependencies of this market to other markets, businesses or the government? What are the supply and distribution channels? Has the market been validated by a customer / partner? What are your advantages and the competitive products/services? What business models have been successful? Who are the key management personnel? Cross-reference to Appendix if necessary. How will you complete the management team if all the key members are not yet identified? How unique is the technology? Can any parts be patented? What is the current development status of product/service? How will the products be tested? 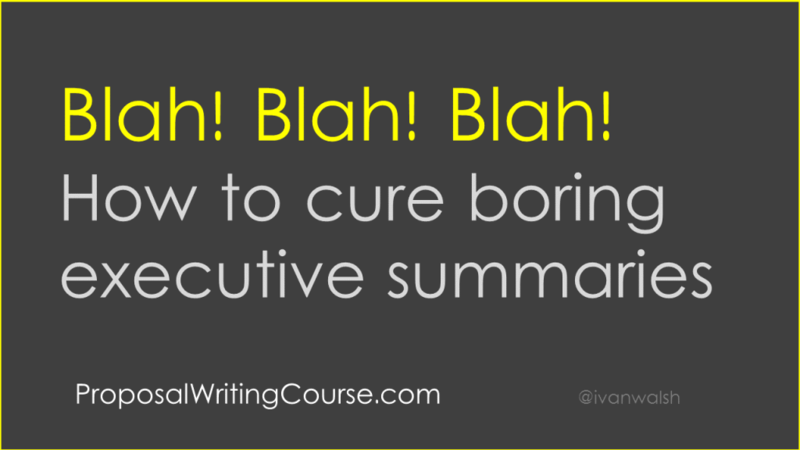 While this looks like a lot of work, the key is to select the parts that you want to highlight in the Executive Summary and move the rest to the main document. Most Executive Summaries are one to two pages max. With this is mind, write the text and get all the information down first. Then revise the material and see where you can refine the wording to reduce the word count, for example, by merging points together and remove filler text. Also, look for phrases that can be pruned and made shorter. For example? Look for ways to remove these fillers. You’ll sharpen the prose in the process and give your document a nice, polished tone. About the Author: Ivan Walsh provides Business Tips for Smart People on Klariti.com. His also runs the popular Business Planning Blog at http://www.ivanwalsh.com. Follow him on Twitter at ivanwalsh. PS: You can get the Business Plan Template from our partner Klariti.com here.